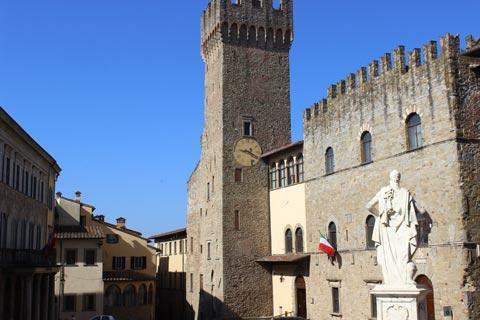 Arezzo is a large historic town in the Tiber Valley in eastern Tuscany, north of Cortona and south-west of Sansepolcro. 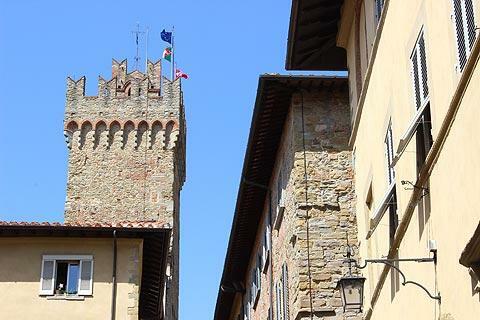 Despite large scale damage in the Second World War Arezzo retains (or has reconstructed) many sights and artworks and it is an exceptional destination with numerous places of great interest to visitors: not to be missed! Renaissance artist Vasari was a native of Arezzo (you can visit the house where he was born) and Piero della Francesca was another very important renaissance artist who worked here and these two renowned artists contributed greatly to the artistic heritage of Arezzo. 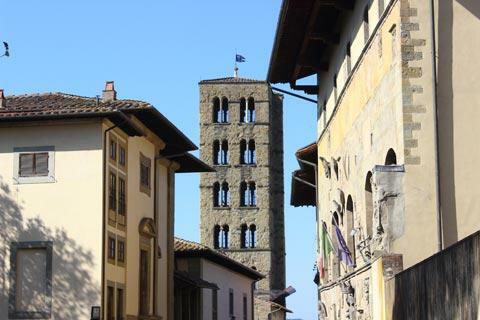 Because Arezzo is so extensive and the roads of the historic city follow quite a complicated layout you will find a map of the town to be indispensable. 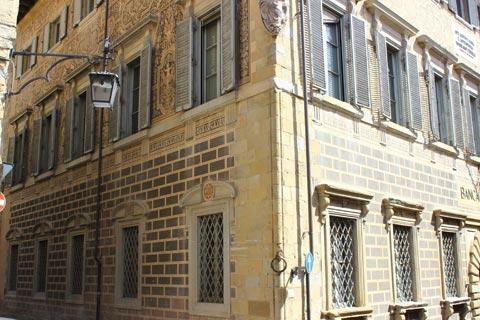 Therefore we highly recommend you start your visit by heading to the Arezzo Tourist Information Office which is opposite the cathedral to the west of the old town. While you are here you can also visit the cathedral itself, which dominates the square from a raised position. Arezzo Cathedral has three aisles with stained glass windows by Guillaume de Marcilatt (1470-1529). The sanctuary holds a marble altarpiece called the Ark of San Donato within which lie the relics of Bishop Donato from Arezzo. Near the main altar in the cathedral is the "Maddalena" by Piero della Francesca. 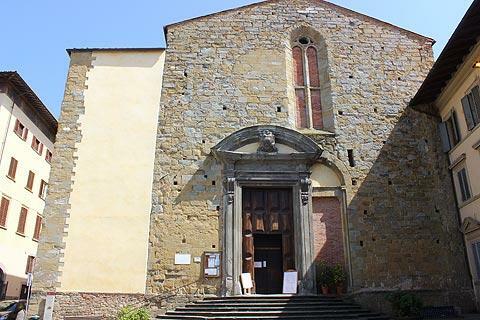 The Cathedral (Diocesan) Museum is one of the most important museums in Sansepolcro. Just behind the cathedral itself, here you can see important art works from the cathedral and other churches in the Diocese. These include a 13th century polychrome wooden Crucifix, some frescoes by Spinello Aretino (1350-1410), the Annunciation by Bernardo Rossellino (1409-1464), the Announcement of death of the Virgin by Andrea di Nerio (1350-1387) and some paintings by Luca Signorelli (1445-1523) and Vasari. 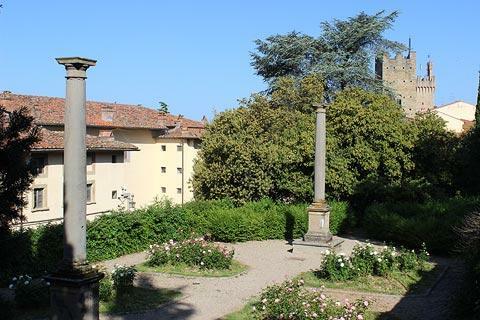 While you are in this part of Arezzo you should also take a stroll through the park behind the cathedral, a large part of which is dominated by the high walls of the pentagonal Medici Fortress. The Medici fortress dates from the 16th century and is a pentagonal bastioned fortification, which according to Vasari was impregnable. The Medici fortress and walls were preserved almost in their entirety until the year 1800, when the French occuped Arezzo and the fortress and destroyed part of the walls. 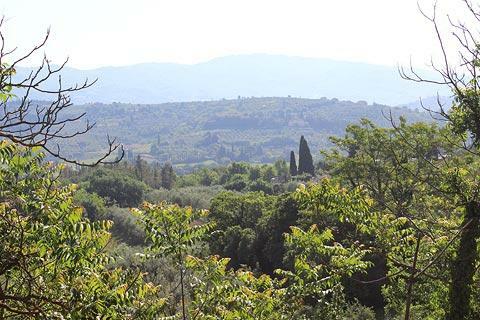 To the edge of this park you have excellent views out across the fortifications and the countryside of eastern Tuscany. 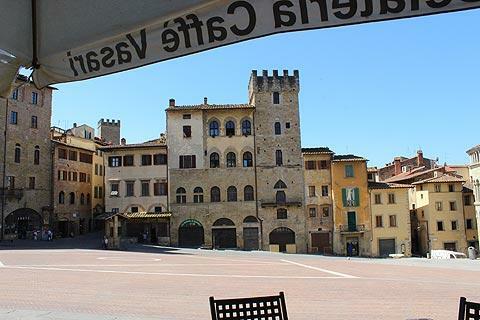 Continue your visit in nearby Piazza Grande, the large central square in Arezzo just south of the cathedral. Many of the most important buildings in the old town are around this attractive square and nearby in the surrounding streets. 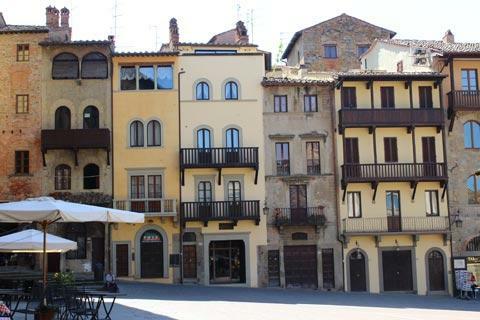 Piazza Grande is one of our favourite medieval piazzas in Italy, with imposing ancient houses and important historic monuments on every side of the square. Curiously, perhaps because it is some distance from the famous church of San Francesco, it was almost completely empty when we visited, unlike the bustling old town to the west of here. Among the particular highlights on Piazza Grande are the long series of arcades along the highest side of the Piazza, designed by Vasari in 1573, and the Palazzo della Fraternita dei Laici (which at a glance looks more like a church than a palazzo). 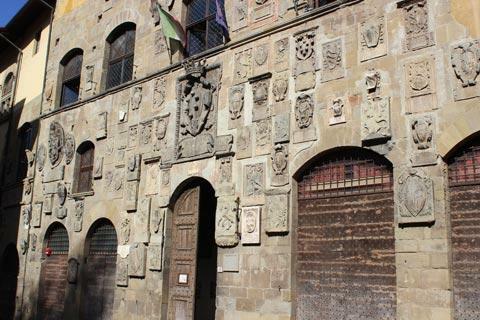 Enthusiasts of Vasari will also want to visit the house where the artist lived at Casa di Vasari which also has his paintings on display, and the Museum of Medieval and Modern Art. 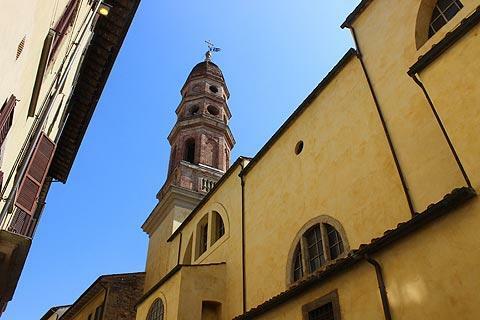 Among the religious buildings in Arezzo, much the most visited is the Church of San Francesco. This church was originally built in the Gothic style although it was remodeled in the 14th century and again at the beginning of the 20th century. The church itself is perhaps not the most interesting in the town from the outside, and inside is quite simple with a single nave, but the Church of San Francesco also contains one of the most important renaissance artworks in Italy: hence the crowds you will likely see gathered in the small square outside. The 'painting' is a large cycle of frescoes around the altar end (the Bacci Chapel) of the church representing the "Legend of the Cross" by Piero della Francesca (1417-1492), who was inspired by the Golden legend of Jacobus de Voragine (1230-1298). The decoration of the Bacci Chapel was initiated by Bicci di Lorenzo (1373-1452), and then concluded by Piero della Francesca in the middle of the 15th century. This large fresco by the Renaissance artist called Piero della Francesca around the walls of the choir area of the Church of San Francesco is really quite exceptional and among the greatest frescoes in Italy. For many visitors this fresco is the principal reason to visit Arezzo - so if you only see one artwork during your visit make sure it is this one! Broadly speaking, moving clockwise from top right to top left, the panels of the paintings trace the history of the cross from its origins in the Garden of Eden to its discovery in Jerusalem. Each of the 10 panels would be considered a masterpiece in its own right and the principal challenge is to appreciate so much great art in one place, or to find the vantage point to best appreciate the works. 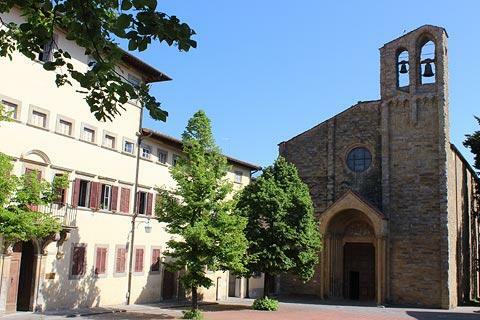 Note: ticket numbers are restricted and you might need to reserve a time slot a couple of hours or more in advance so we suggest you go to the Church of San Francesco as soon as possible after you arrive in Arezzo to get your tickets, then explore the town and return here when your visit is due to start. 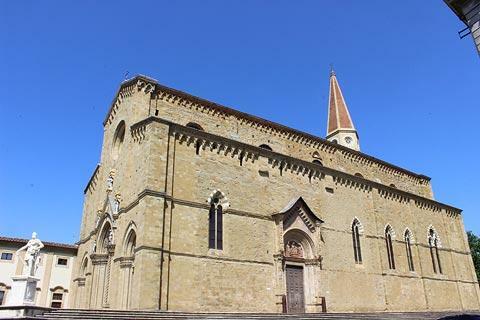 If time permits there are several other notable churches in Arezzo which we suggest you visit. Among these is the Church of Saint Dominic, in the gothic style and with a romanesque portal. Inside the church apse you can see the painting 'Crucifix' by Cimabue (1240-1302), the first of three crucifixion paintings by the artist and a very important 13th century work of art. The Church of Saint Dominic is also quite an unassuming church from the outside, and in a very quiet location a short distance north of the cathedral, so it seems quite remarkable to discover such a highly regarded artwork here! The Church of Santa Maria is just off the bottom corner of Piazza Grande and is popularly known as the Chiesa delle cento buche [the Church of a hundred hollows], because of its belltower with 40 windows and decorative carved reliefs which together create an impressive Renaissance style facade. The interior of this church is divided into three naves with a raised presbytery above the crypt in which lies the reliquary of San Donato. On the main altar there is a polyptych by Pietro Lorenzetti (1285-1348), dated 1320. As well as all these famous and interesting monuments, the historic centre is also very pleasant to just walk around exploring. 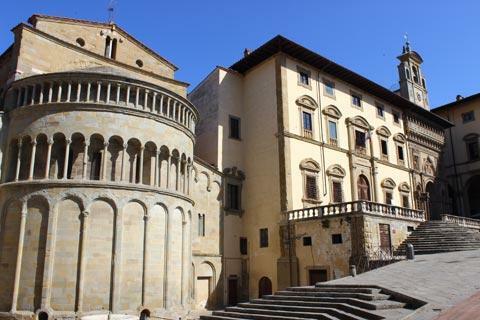 You will discover many palazzos and small churches that we have not described above but which ll contribute to the charm of Arezzo. 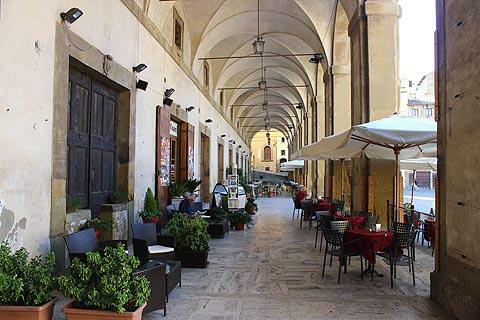 The area along Via Cavour and Corso Italia is the heart of the old town, and there are numerous cafes and shops to interest you and tempt you. 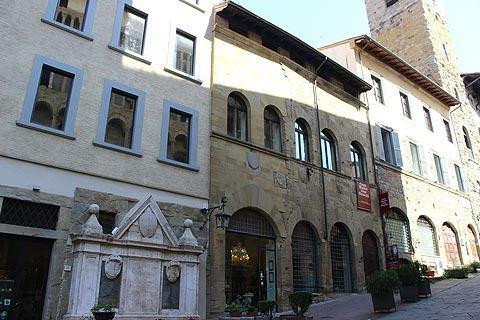 A more extensive range of modern shops can be found in the more recent part of Arezzo to the south of the town, around Via Roma and Via Margaritone. 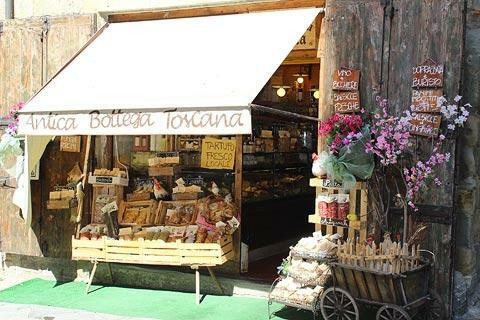 Here you will find all the usual clothes and general shops that you see in all larger Italian towns. Also here in the south of the town there is a Roman amphitheatre, with a reasonable amount of the theatre intact: unfortunately due to vandalism the monument is closed to the public so you don't really see very much when you visit. Next to the amphitheatre is a monastery that was formerly run by Olivetan monks. 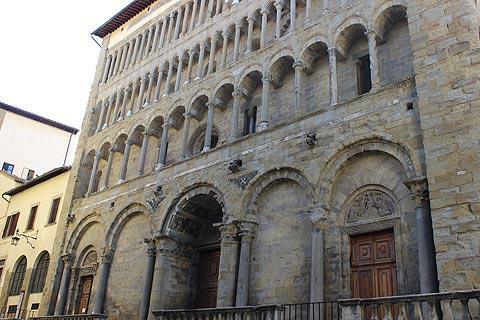 This building now holds the Archaeological Museum which collects Etruscan, Roman and medieval finds of Arezzo. Just outside Arezzo town is the Sanctuary of Santa Maria delle Grazie, built in the mid-15th century by Saint Bernardine of Siena (1380-1444). The church has a nice porch built by Benedetto da Majano (1442-1497) and in the interior on the altar is a remarkable work by Andrea della Robbia. We also recommend that nature lovers explore the countryside and surroundings of Arezzo for its natural beauty, such as the Nature Reserve of Buriano Bridge which stretches between Arezzo and Civitella in Val di Chiana and Laterina. The landscape has a varied landscape mainly of oak, holm oak and cultivated areas. 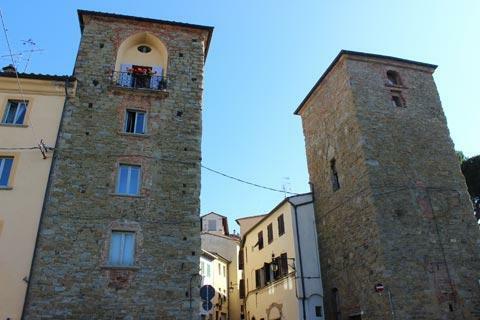 We also enjoyed a trip to the east of Arezzo to visit the town of Sansepolcro, with an attractive historic centre and a museum with works of art by Piera della Francesca, and to explore the lovely ancient village of Anghiari, listed among the 'most beautiful villages in Italy'.